Today’s recipe is my solution to all of the leftover turkey you have after Thanksgiving. I love leftovers, but sometimes there is so much turkey I cant bear to eat it in its original form. 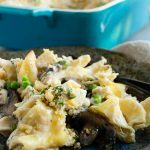 Turkey tetrazzini casserole is a pasta noodle dish with a cheesy rich sauce that won’t remind you at all about turkey and stuffing! Funny thing about this tetrazzini, by the name of it you would think it is an Italian recipe. 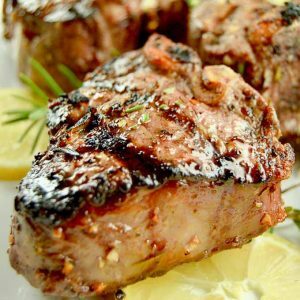 But it’s actually an American recipe that is named for an Italian Opera Singer Luisa Tetrazzini (1871-1940). It’s usually made with a non red meat mixed with pasta noodles in a creamy cheese sauce. It often has mushrooms, onions and vegetables with some almonds in it. I’m taking a little liberty with the recipe today. I adapted a cheesy noodle recipe of my moms but subbed in turkey and mushrooms into it. I’ve used peas, but if you have leftover green beans from Thanksgiving toss those in instead. 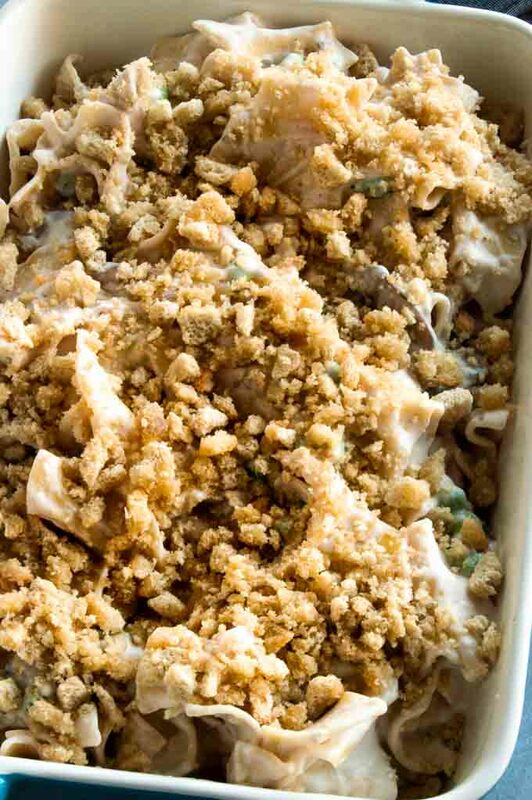 The easy turkey tetrazzini hot dish is made with a light, tangy cheese sauce tossed over the noodles with the earthy softened mushrooms woven throughout. Baked in a casserole dish, it has a crunchy panko topping that ties the whole thing together! 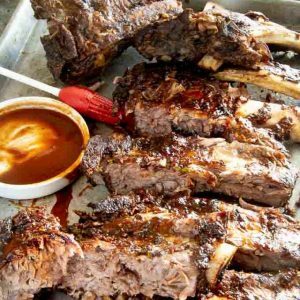 It will work for a meal the day after thanksgiving to have while watching football or you can make this for a potluck or as a dish to drop off for a neighbor. Get the ingredients ready. 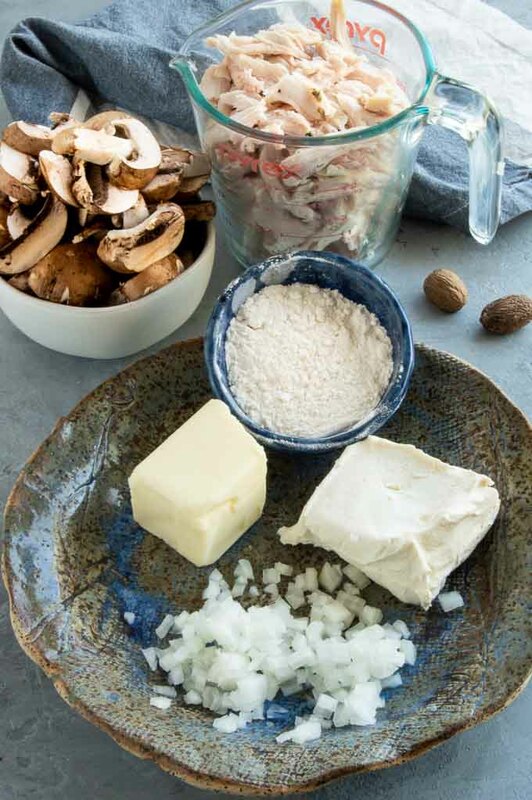 Slice mushrooms, mince onions, shred chicken and measure out the cream cheese, butter, parmesan, peas and the nutmeg. Cook the pasta but cook it to al dente so its a little firm. Doing this guarantees the pasta does not turn mushy when baking. 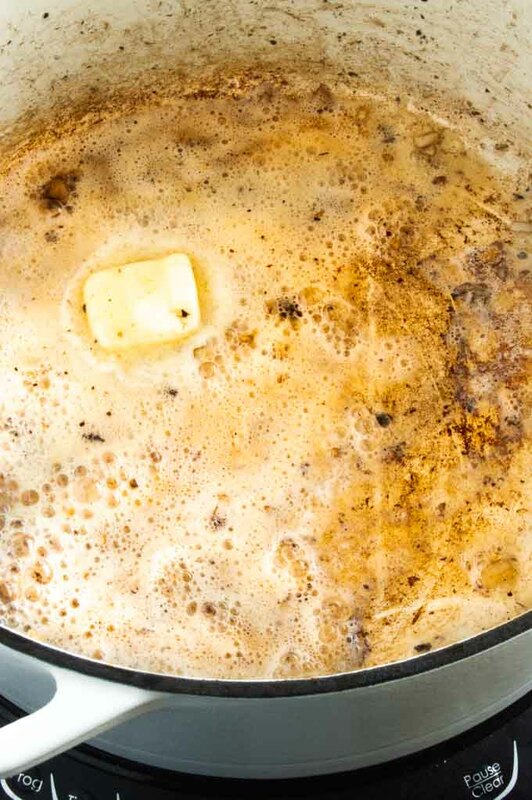 Melt butter with mushroom juices. 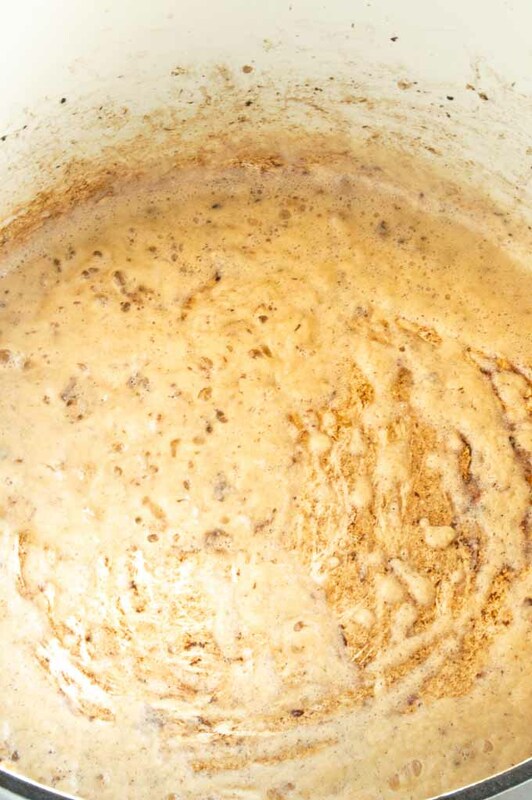 Make a roux with the flour and cook for a couple of minutes to to get out the powdery taste. Add in the milk and half and half and bring to a boil to thicken. Add cream cheese and let it melt completely. Sauce should hold firm to the spoon. Add pasta and add-ins to pan. Bake until warmed, and topping is golden brown. We didnt have any turkey leftovers. Can I use chicken? yes! 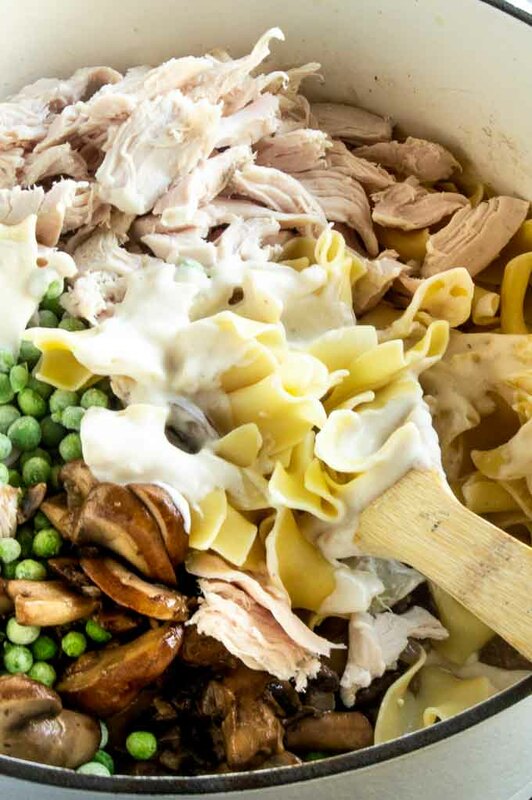 Make this tetrazzini with roasted chicken meat and you can make it all year long! Can I freeze this if I have a LOT of turkey leftover? 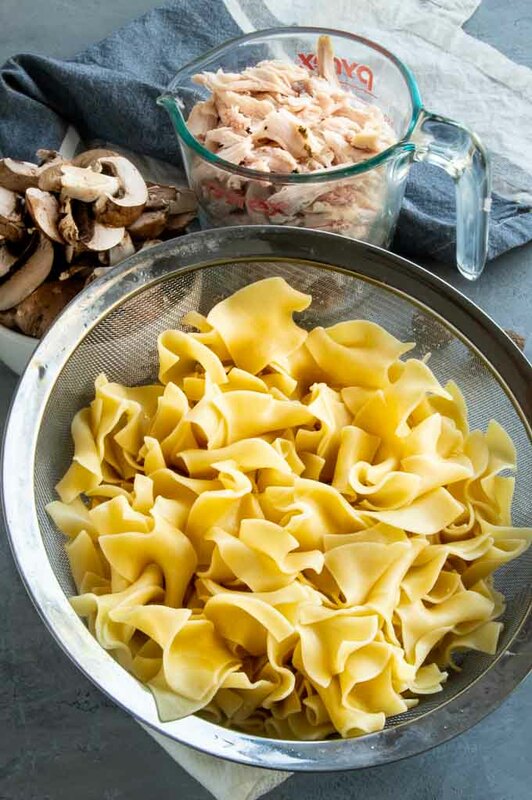 Tetrazzini stores really well in the freezer, place it in an airtight sealed container and it will reheat well. Defrost, then either warm in the oven on low, or microwave in 1 minute increments until hot. Freshen up with some additional parmesan cheese on the top. What wine can you pair this with? 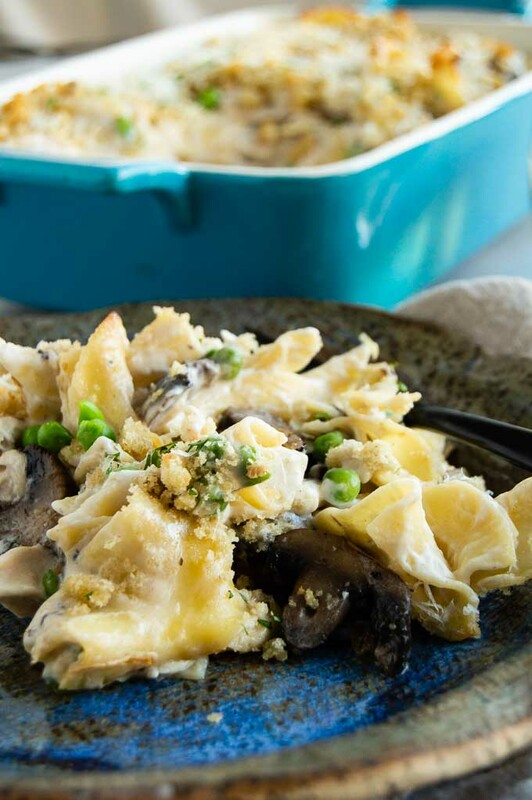 This tetrazzini casserole would go great with any light white wine that is slightly sweeter. 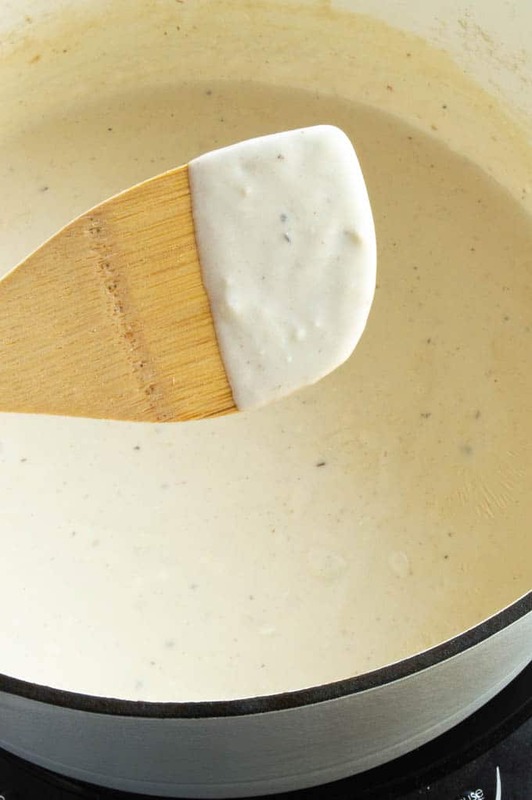 A prosecco or a crisp sauvignon blanc will go great with the creamy tangy cheese sauce. 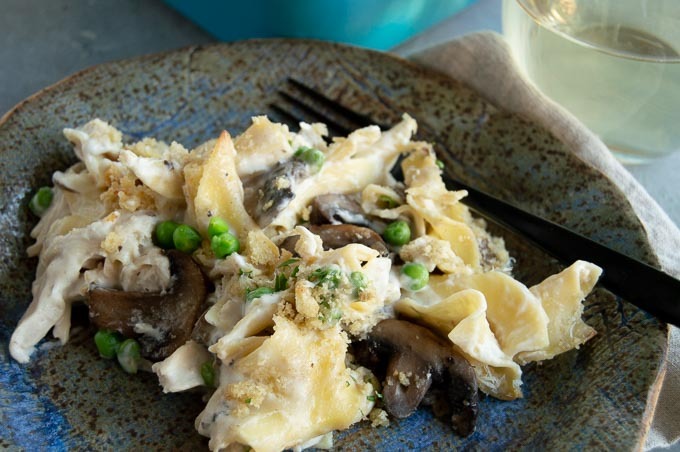 What can I serve with tetrazzini? Serve the turkey noodle hot dish with a light salad for a complete meal. Cook the egg noodles according to the package directions. I suggest cutting the time to the lower end or 2 minutes less than the package recommends. The dish gets baked at the end, and this will make it so the pasta does not go mushy. Strain out water when done and set aside. 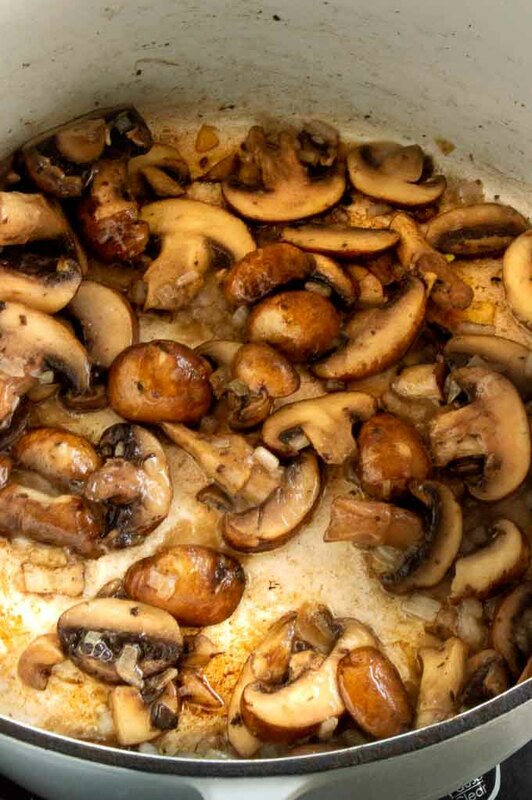 In same pan melt 2 tablespoons of the butter and sauce the onions and mushrooms for 10 minutes until mushrooms are softened. Remove from pan and set aside in a bowl. Bring pan to medium high heat. Melt 2 more tablespoons of butter then sprinkle in the flour and whisk quickly to completely combine. Cook for 2 minutes to get rid of the flour taste and bring out the nutty flavor. Add in milk and whisk until combined. Then add the half and half slowly and whisk until well blended. Raise heat to high, bring to a boil and let cook for about 10 minutes until sauce starts to thicken. Once sauce has thickened, add in the cream cheese and let it melt completely. Remove pan with sauce from heat. Add in nutmeg and season to taste with salt and pepper. Add turkey, peas, mushrooms/onion and noodles to pasta and stir to mix well. Place into 9X13 casserole dish. Melt last tablespoon of butter in microwave. Toss bread crumbs in the butter. Sprinkle breadcrumbs over the top of the casserole. Bake for 15-20 minutes until the breadcrumb topping is golden brown and the noodles are heated throughout. This sounds like the perfect comfort food! 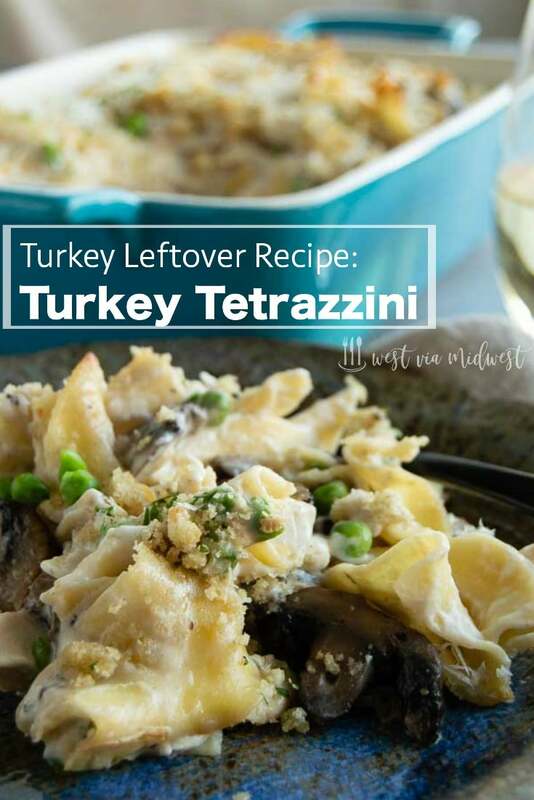 I love the idea of using turkey in tetrazzini! Yummy comfort food for Thanksgiving. Perfect for the whole family. I love a good casserole especially when you can use up leftovers! Why have I never thought of this?? I make a Tuna Tetrazzini all of the time, but I had never thought to use my leftover turkey!! I bought a big bird for the holidays, I know this will be a great way to use the leftovers!! Thanks so much! My mom will love this when I make it for her. Tetrazzini is one of her favorites! 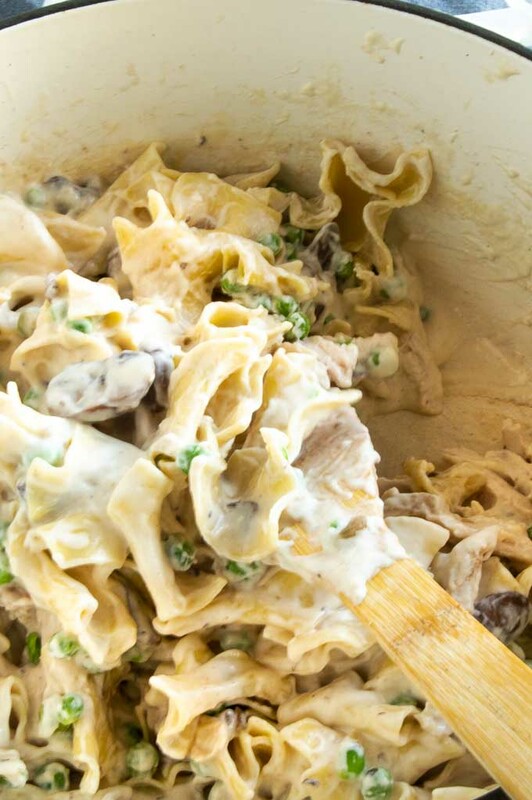 This dish is pure comfort food!Love the noodles and mushrooms with that creamy and delicious sauce. 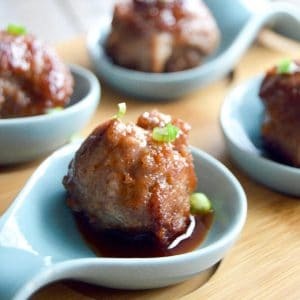 Lots of great ideas for all the leftovers too! I can’t wait to start making them. Tetrazinni is like the king of casseroles and I am so ready to try this one! My mom always made tuna ones abut this is more my speed! I hope there is lots of leftover turkey for this! 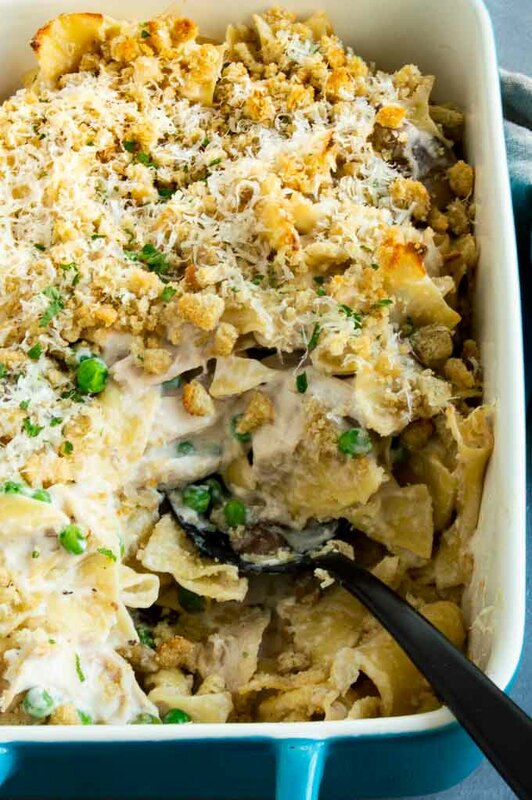 This tetrazzini looks amazing! 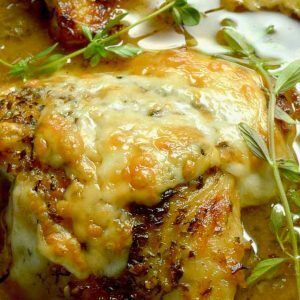 It’s perfect comfort food and such a great way to use up leftover turkey!